As I say, hot glue is magical. For lots of reasons. Including the fact that such an ordinary material can take on the shimmer of spun glass. I call it my poor woman’s glass! Paul Klee referred to drawing as “taking a line for a walk.” With hot glue, I’m able to take a line for a twirl—and do it again and again! I’m obsessed with rippling lines, infinite variations of the S-curve, the serpentine line (aka William Hobarth’s legendary line of grace). Since moving to north Idaho, the “ripple effect” has taken hold of my senses. It’s everywhere—in the the rollings hills of the Palouse where I live. As intricate as a leaf’s vein, the filigreed glue strands take on the lacy, tactile complexity of a spider’s web when massed by the hundreds. Responsive to changing life and shifting air, they shift between thresholds of opacity to translucency, the space seeming to dissolve into an inexplicable frothiness. It’s how I imagine infinity would look. This fuzzy edgeless quality suits my purposes. As an artist, I’m trying to allude to our barely there-ness, the fragile temporality of existence. 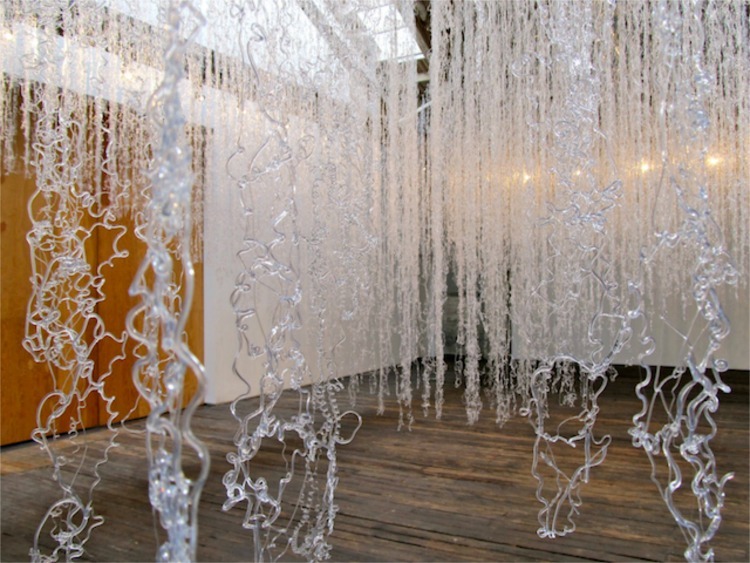 In this way, hot glue is a fast track to metaphor—referencing the flux and fluidity of time. Like the barely perceptible moments of our lives, the way they appear and disappear, intermingling like rippling water and melting ice as they flow through our days. Okay—Enough, enough. I’ve restored my resolve. Back to work!